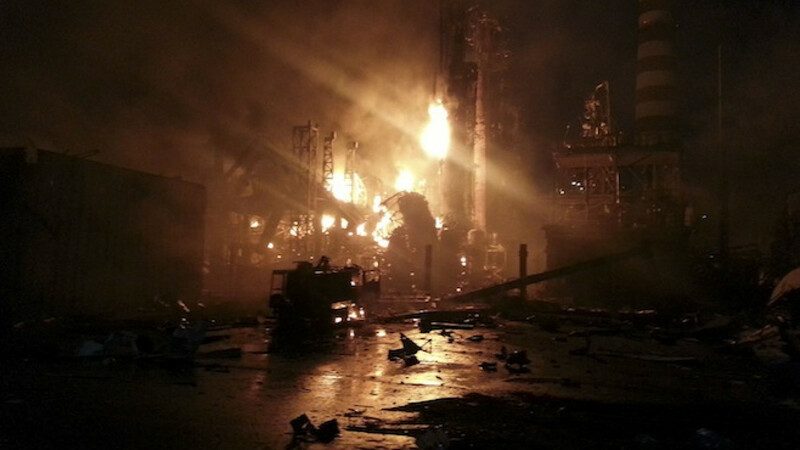 Firefighters work at the site of a blaze at Rosneft’s Achinsk oil refinery in which at least five people were killed. At least five people have been killed and seven injured in an explosion at a Rosneft factory in the Siberian Krasnoyarsk region on Sunday evening. The incident at a refinery in the town of Achinsk resulted in a blaze covering an area of about 400 square meters as gas pipelines caught fire, the BBC's Russian service reported. Three other people are still unaccounted for, the report said. News agency ITAR-Tass cited witnesses as saying the explosion was felt throughout the entire town, and some buildings in close proximity to the blast were damaged as well. Black smoke was visible from several kilometers away, the report said. In a statement on its website, the Emergency Situations Ministry said the fire was currently under control. "At the moment work is being done to suppress the fire, review and wash down the collapsed structures, and also to examine the rubble and civil engineering structure" for further investigation, the ministry said. The Investigative Committee has opened a criminal case on charges of violating safety requirements and causing the death of more than two people by negligence, a statement on its website said. The charges carry a maximum punishment of seven years in prison. The plant belongs to the company Neft-Aktiv, a subsidiary of Rosneft.